I've started another blog devoted to the Scratch programming language. Scratch is designed for kids as it's easy to create projects that include motion, color, and sound. Kids can import their digital photos, music, and record audio directly into Scratch using the microphone input on the computer. I captured this graph from the Scratch website to show you that there are a significant number of Scratch programmers. 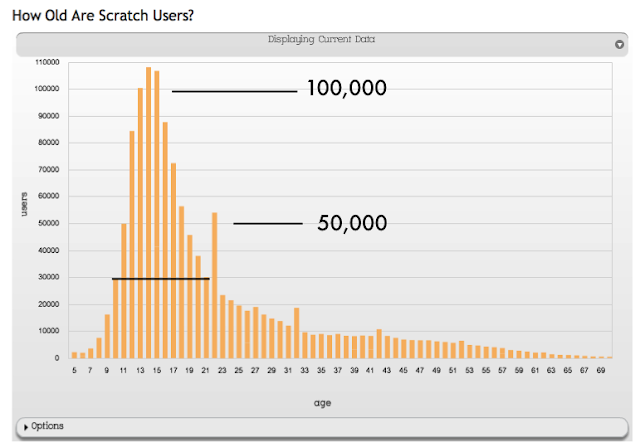 The graph shows the number of registered Scratch users by age. Note that there are over 300,000 in the 13 through 17 years old peak of the graph. The horizontal bar shows the number of users from the age of ten to twenty one. As a registered Scratch user myself, I am an outlier whose age doesn't even appear on the right side of the graph! Also note that there are a number of older Scratch programmers. These users tend to have high skill levels and produce some amazing programs for a kids-focused site. I only know of one educator, a high school math teacher, that is actually teaching Scratch to students. My guess is that most of the kids that appear in the above graph are not using Scratch at school but are using it at home or outside of formal class instruction. As a math educator myself, it amazes me that the new math standards do not recognize programming as an example of applied mathematics or as an incredible problem-solving environment! where they will find a growing series of short introductions to Scratch programming. The first is a video that tells you how to download Scratch (Free!) from the Massachusetts Institute of Technology Media Lab. Scratch is financially supported at the MIT Media Lab by generous grants from the Microsoft and Intel corporations. It is a very active site that literally changes from minute to minute as new uploaded projects are displayed.